Previously in this series we have looked at a general overview of OpenIDM and had a detailed look at objects. In this blog I want to explore connectors. Connectors are the integration glue that enables you to bring data into OpenIDM from all sorts of different systems and data stores. We will take a look at the different types of connectors available in OpenIDM, how they work and end with a practical example of how to actually configure a connector. Every identity system that I have ever worked with has a concept similar of a connector. Usually they comprise of Java libraries or scripts that perform the actual push and pull of data to and from a target data source. 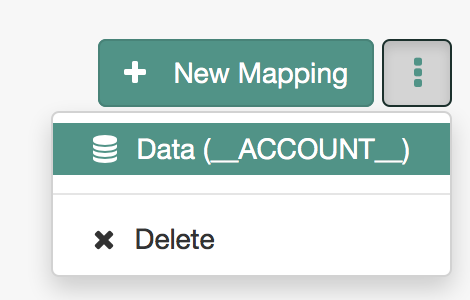 Create: Create a new object ( usually an account ) in a target data store. Update: Update an existing object e.g. if a user changes their email address then we may want to update the user record in a target data store. Get: Retrieve a specific instance of an object ( e.g. an account) from a target data store. Search: Query the collection and return a specific set of results. There are a number of other operations which we will explore in later blogs. Reference to the underlying Java class that implements the connector. This should be populated automatically when you choose your connector type. You can explore the connector source code if you like but for the most part you shouldn’t need to be concerned with the underlying classes. All of the credentials and configuration needed to access the data store. You need to configure this. The data store schema for the object or account. You need to configure this. provisioner.openicf-something.json ( where something is whatever you have named your connector ). Note connector configuration files will not appear unless you have configured a connector using the UI, we will revisit this later. Provisioner engine invokes the connector class with the requested operation and the data from the synchronization engine. Connector class uses the configuration parameters from the provisioner file and the data passed in the invocation to actually do the work and push or pull to or from the target. So now we have a basic understanding of how connectors work, lets try configuring one. I’m going to use the CSV connector for this example and we are going to read users from a Comma Seperate Value list. Ultimately we will be reading this data into the managed user object using a mapping. For this blog though we will just focus on configuring the connector. Feel free to use any CSV file but if you want to follow along with the example then download the CSV here that I created using Mockaroo. Then log in to OpenIDM as administrator. 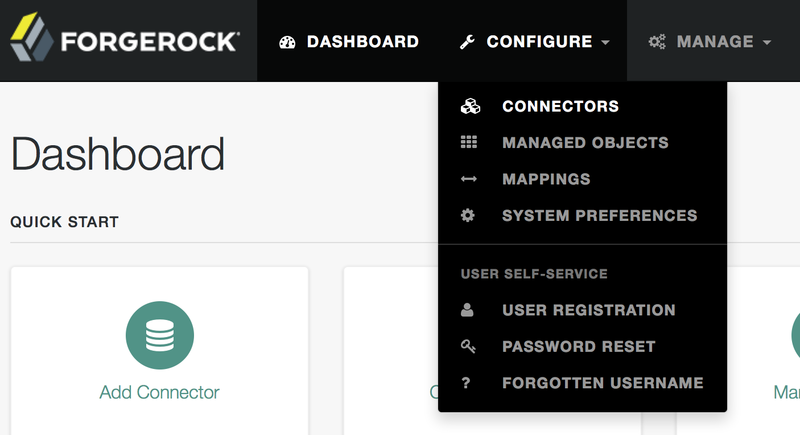 Navigate to Configure, then Connectors. Give your new connector a name (I have used UserLoadCSV above – no spaces permitted), and look at the connector types. These are all the different systems you can integrate with. Note that with further configuration, more connectors are available, and using the scripted connector you can pretty much integrate with any system that offers a suitable API. 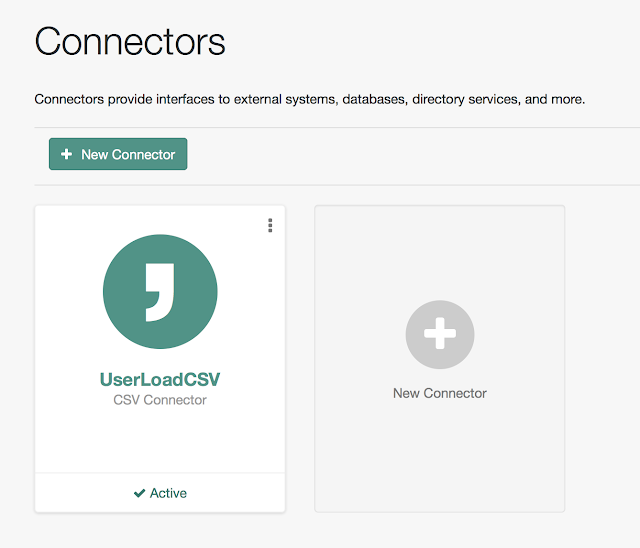 Select the “CSV File Connector”. Now we need to complete the “Base Connector Details”. Starting with the path to the CSV File we actually want to process. They are populated by default but we need to configure these up to match our spreadsheet. So in this instance we just need to change the Header UID to match. Header Password: We will not be processing any passwords from this CSV, that might be something you want to do, although typically you will have OpenIDM generate passwords for you ( more on that later ). Quote Character: If you have an unusually formatted CSV, you can change the character that surrounds your data values. This is used by OpenIDM to successfully parse the CSV file. Field Delimiter: Similarly if you are using a delimiter ( the character that splits up data entries ) that is anything other than a “,” you can tell OpenIDM here. Note that these parameters are all unique to the CSV connector. If you were to use another connector, say the database connector, you would have a different set of parameters that must be configure for OpenIDM to successfully connect to the database and query the table. All being well you should get a positive confirmation message. Congratulations, you have added a connector! All very well but what can we do with it? If you have done everything correctly you should see the data from the CSV in OpenIDM! It is important to understand, that at this point the data has not been loaded into OpenIDM, OpenIDM is simply providing a live view of the data in the CSV. This works for any connector and we will revisit it at the end of this blog. What you should be able to see if a list of all of the attributes in the CSV file. OpenIDM has automatically parsed the CSV and built a schema for interpreting the data. You may also spot “__NAME__”. This is a special attribute, and it maps to the Header Name attribute we configured earlier. Again, the concept of Object Type is universal to all our connectors and sometimes additional configuration of the Object Type may be required in order to successfully process data. On this page you can configure LiveSync. LiveSync is a special case of synchronization. Ordinarily synchronization is performed through the mappings interface ( or automatically on a schedule ). However if the connector and target system support it, then LiveSync can be used. With LiveSync changes are picked up as they occur in the target. Ordinarily with a normal synchronization ( often called reconciliation ) all accounts in the target must be examined against the source for changes. With LiveSync, only accounts in the target that have changed will be processed. For this to work the target must support some form of change log that OpenIDM can read. In systems with large numbers of accounts this is a much more efficient way of keeping data in sync. As before, we can make use of the REST API here to query our new connector. 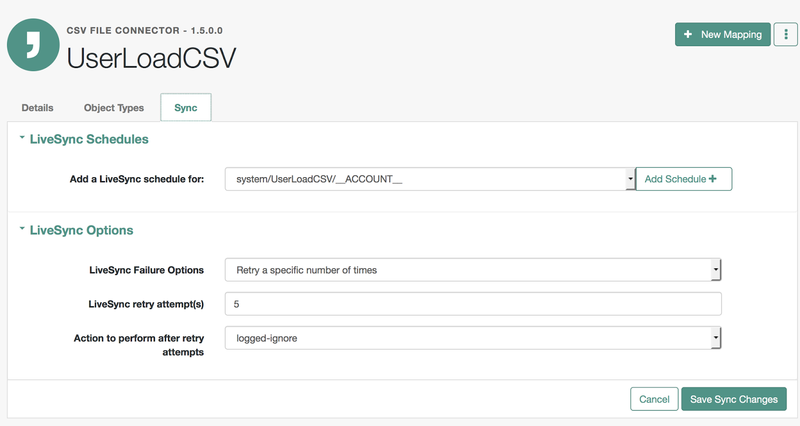 We can actually use the API to read or write to the underlying CSV data store. Just take a moment to think about what that means. In an enterprise implementation you might have hundreds of different data stores of every type. 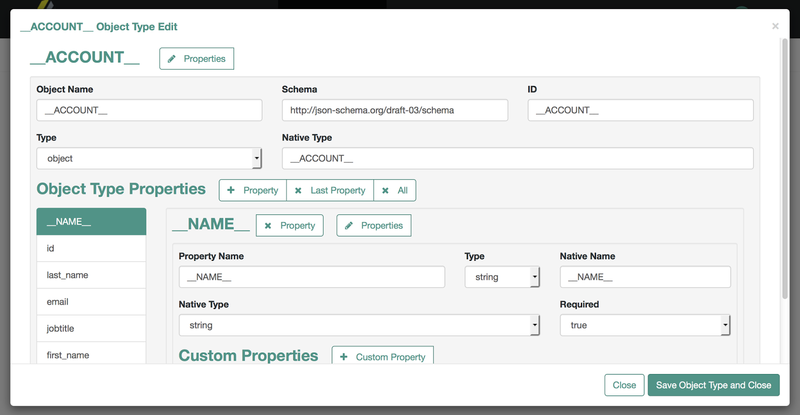 Once you have configured connectors to OpenIDM you can query those data stores using a single, consistent and centralised RESTful API via OpenIDM. That really is a very powerful tool. As before, this corresponds to our REST API. Please fire up Postman again. 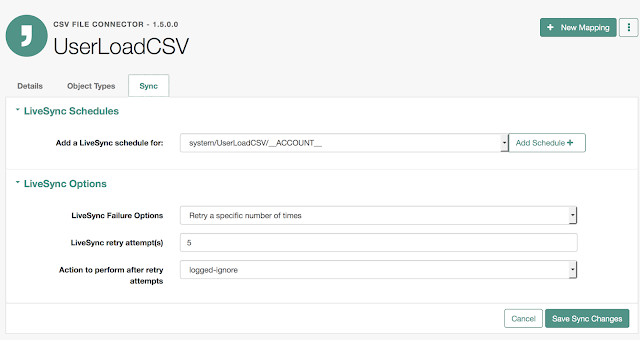 We have just queried the CSV file using the REST API, and retrieved the list of usernames. Here we are searching for the user with the email address tgardner0@nsw.gov.au. Come back next time for a look at mappings where we will join together the managed user and the connector to actually create some users in the system.